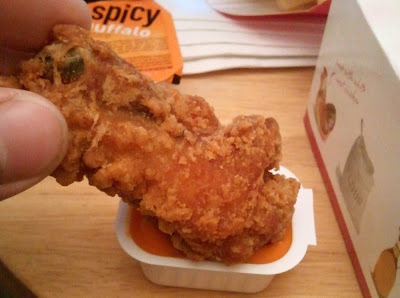 As all of you loyal readers know already [link missing], McDonald's has a limited-time-only food option of chicken wings. Bone-in-wings. (twss). This is revolutionary. If only KFC had thought to sell chicken meat on the bone. But for real, it's kind of a big deal. McD's is trying to do to Buffalo Wild Wings (et. al.) what it did to Starbucks. 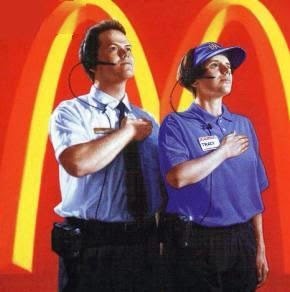 Everyone knows that BDubs and SBux are better, but McD's is hoping that you are poor enough and indiscriminate enough to not care what you are putting into your body and therefore will settle for fulfilling all of your culinary needs at the golden arches. You think you know, but you have no idea. This is the true life story of eating McDonald's Mighty Wings. This saga, like always, starts in the Drive-Thru. (It's 2013, why are we still red-underlining "thru?") So the McDonald's nearest to where I sleep is still a terrible McDonald's. Last year they demolished the building and totally rebuilt it to be new and super sweet. And it is not. Lipstick on a pig and all that. Same employees, same slow and bad service. But there are two drive through thru lanes now and LCD TV menus inside. So it is better! No one else is in line, which is always kind of a pressure situation, right? Because the lady on the microphone wants to know what you want to eat, but you haven't really had time to look at the menu yet. Which, it's McD's and you should already know what you want, but they have all sorts of new and confusing menu items so just like gimme a minute okay? I knew what I wanted though. Mighty Wings! The microphone lady introduced herself by name and asked what I would like to order. Weird. It must be some sort of new corporate strategy to make my McVisit seem more McPersonal. I dunno. I go to this place like 4 times a year. And just like my 4 times a year Wal-Mart trips I always tell myself that I'm never going back. Alas. So I tell Fantasia that I would like a 5pc McWings w/ Spicy Buffalo Sauce plus a Lg. Fries plus a Dbl. Chsbgr. (just in case) and she tells me $8.18 come around to the window number 1. Whoa, wait, what? Yeah, the McDonald's Mighty McWings are $4.99 for five. That is a dollar a wing. That is not a good deal. Minus sign number one for this adventure: price. Sure, they can't subsidize the cost of wings with beer sales like real wing places can, but still. That's pretty steep, McD's. Here's something cool I noticed about the drive-thru during the 10 minute wait: the menu is in four sections and each section is a triangle. On one face is breakfast, lunch, other/whatever, respectively. That's pretty ingenious. How many years of an underpaid teenager going out at 5am to change the signs did it take before someone had the idea to make rotating menu plaques? Ten minutes waiting for food. Were they butchering the chicken and breading its limbs while I waited? It wasn't even busy. And they had the dude before me pull into the special "I am still waiting for my food" parking spot. I am a patient man, but I could probably get a Chipotle faster than this (depending on who is in line). Eventually, I am driving home with a hot sack of salted fat riding shotgun (and this time it's not your mom! (OH SNAP!)). Gotta fist some fries into my face, nomnomnom. Okayokayokay, just review the food already, Tolstoy! (What's the hurry, bro. You already know what I'm gonna say). Tiny circle table to enhance flavor. Beer because soda pop is bad for you. The first thing you'll notice from this picture is that the Main Box is a 20pc McNuggets box. Oh no! I hope they didn't give me chicken-off-the-bone by mistake! 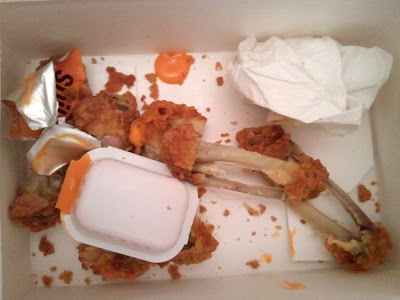 Either they didn't design a new box for the wings, this restaurant ran out of those special boxes, or the employee boxing the chicken didn't care. I'm leaning toward that last one. What the heck is a 5-piece? No chicken has five wings. Plus, this is America. 6, 12, or gtfo. Who decides what pieces go in a five piece? Is that a corporate decision, or the guy/gal frying my wyngz, or random? You'll notice there are two drumsticks and three, uh, of the other shape. For the record, I prefer the "other shape," so this is a good balance. I need to know, though, was this deliberate, or was it fate? These are questions better left unasked. In fact, when it comes to McDonald's in general, most questions are better left unasked and unanswered. Let's get to the eating! So, umm, this is awkward. Right away I can tell that dunking won't work. It's not really a testament to the huge succulent chicken portions. Because the chicken isn't those words. It's more like they don't care about how you dunk. Do you know how expensive it would be to develop a wider/deeper/more effective sauce packet? Do you?! I was half tempted to open both sauce packets and dump them in the box then close the box and give it a good shake. That seemed messy, though. And for me, eating wings is all about not being messy. So I sort of just poured slash side-dunked each wing into the sauce. Crunchiness: They were crunchy. It was a dry crunch. Not like the perfect level of crisp, but like they spent about 4 hours too long under the heat lamp. Over dry. Salt: Very salty. That might have contributed to the too-dry mouthfeel. Dry and salty. Spice: Un poco picante. Not like hot. Not like mouth spice. But there's definitely a slight spice aftertaste that is more than just salt burn. It's enough that you don't need buffalo sauce and could instead choose ranch. Sauce: The wings don't necessitate sauce. You're an intrepid wing eater, though, and your mouth demands sauce. You can chose from Spicy Buffalo, Chipotle BBQ, Creamy Ranch, Honey Mustard, BBQ, Sweet & Sour. The website lists a few more options that I don't think they had at my local McD's. I got the Spicy Buffalo of course. It is pretty spicy! Definitely a kick! It is a creamy sauce. Probably similar to BW3's Medium wing sauce. It's definitely the sauce to get. Meat: These wings are not huge. They are not tiny either. Average wing size. There was meat on the bone. The meat wasn't fall-off-the-bone tender. It also wasn't stiff and clingy-on-bone. A very reasonable wing, especially for McDonald's. (Except for the cost per wing. I want to see these get down to $.60/wing, at least. If they really catch on, I want to see $.45/wing. Hey, that's how you gotta hang.) 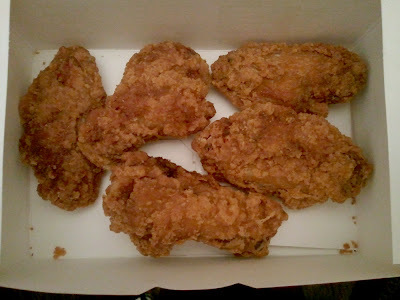 Also, btw, you can get a 3 piece wing box. Is it even worth it? Aftermath: The benefit of waiting a day to write this review is that I get to fully cycle the meal. You know, for a real overall impression. (Oh, btw, I ate these while watching the Bengals crush the Jets, hashtag sports.) And I can't really see myself buying these again. 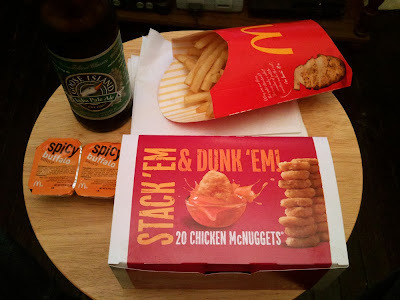 The first factor is that I rarely eat McD's and the second factor is that they're not that good of wings for the cost. And the third factor is in the toilet, to put it delicately. Sparing you the details, it was unnatural. Never eat at McDonald's, you guys. Also, you have to dispose of the bones. Just like a dead body. The shame and self awareness starts to set in. OMG, what have I done? I have to hide these. No one can know. If you're looking for wings for game day, these are not the droids you're looking for. You're better off getting Pizza Hut WingStreet™. Or making your own. Or BW3's / favorite sports bar. You don't need these wings in your life. McDonald's is meddling where it doesn't belong. Don't get me wrong; it's cool that fast food is diversifying. But no. Have I been clear enough? Bad wings. Bad price. Don't buy. Sometimes you go to Wal-Mart because you need a [item] and don't want to pay more than [amount] for it, but when you go to get it you're like "i shoulda just bought it on amazon and waited 2 days." And sometimes when you go to McDonald's because you want a [food] and you only have so much [time/money] but afterward you're like "aw shoot, I shoulda gone to Brown Bag Deli." Support local! 1. I like that you give a detailed analysis of food that makes me curious but would likely not eat. Thank you for taking one for the team. 2. Soooo...you said that the chicken wings may or may not have been the easiest on your stomach. BUT, you also ordered a fry and a dbl. cheezburger. Is there a possibility that maybe one of MceeDee's greasy monstrosities pulled a number on you? I demand a RE-DO to determine the full effects of the chicken wings alone. hashtag, flawed. It may or may not have been the wings themselves, you're right. But I probably won't go back to find out. It was, in fact, too much food. In addition, it was too much of a specific junk food of which I don't usually eat too often. I made fun of Morgan Spurlock for barfing after his first McMeal in his hit documentary "Supersize Me." But now I am more sympathetic (he's still a wussy tho). If you stop eating McD's for a while then eat it again...well. Ill effects. In regards to item number 3: yes I will always explore the culinary abominations unleashed upon us. I've reviewed KFC Bowls in the past. I don't know what a satisfry is, but it sounds like BK, and they're on my blacklist. Could possibly make an exception. I saw some pumpkin flavored tortilla chips at the Krog, but that just doesn't sound good. Anything pumpkin would be biased, because I don't really like pumpkin flavor. (I've been making exceptions for pumpkin beer and pumpkin pie).